Tavis: To your point about Citizens United, one of the ways that we might push back on this money being the mother’s milk of all of our politics notion, one of the way to push back on that would be some real, some serious, campaign finance reform. There was hope back in the day that the president might eventually get around to that, but both he and Romney, you know, just played by the rules the last time around. So the politics get flooded with $6 billion, $8 billion dollars of money into these various pots. So it raises this question. What evidence do you because I don’t see any as yet? What evidence do you see that this president this time around is serious? I’ve not heard him in any interviews say anything about campaign finance reform as one of his priorities. How do we get to that if this president, with all the money he raised, won’t ever put campaign finance reform on the table? Sanders: Well, Tavis, you’re raising exactly the right questions and the answers are difficult. To my mind, the only way we move this country, number one, in overturning Citizens United, number two, moving the public funding of elections, is through a very, very strong grassroots movement that gives the president an offer and members of Congress an offer they can’t refuse. People have got to understand that the issue in Congress is not what the media talks about on why can’t Democrats and Republicans get along. That is not the issue. The issue is that, to a very significant degree, the Congress of the United States of America is controlled by a handful of extraordinarily wealthy people and corporations, Wall Street being at the top of that list. And unless we address that issue, I fear very much for the middle class. I fear very much for our kids, for low income people and for seniors. Give you just one example, one example. You have this business roundtable which is the organization representing the CEOs of major corporations in America. These guys, without exception, make huge amounts of money. Some of them are worth hundreds of millions of dollars. All of them have these great retirement packages that the average American could not even dream of. Couple of weeks ago, they made an announcement that it is their view that we should raise the Social Security age to 70 and the Medicare eligibility age to 70 as well. Can you conceive of the arrogance of these people who are at the top one-tenth of one percent of the income stratum telling working families that, before they can collect Social Security, they got to be 70, before they can get Medicare? So all of this is about the continuation of a class warfare being perpetrated by people who have incredible wealth, incredible power. Citizens United makes it even worse. And at the end of the day, unless we have a strong grassroots political movement which says, excuse me, we’re not going to maintain this incredibly unequal distribution of wealth and income in America. Excuse me, the United States government is supposed to represent all of the people, our kids and the elderly and workers, not just billionaires. Until we have that movement, I doubt very much that you’re going to see the kind of political changes in Washington that we need. Tavis: Some believe that the only way to really deal with this would be a constitutional amendment. That’s really the only way to push back now, given what the Supreme Court has already decided on Citizens United. As you and I both know, being good students in our political science classes, that a constitutional amendment is the most difficult thing in all of the body politic to actually accomplish to get done. What are your thoughts about whether or not at some point in the future it might require and might it be possible that a constitutional amendment could be advanced to actually and finally do something about money in our politics? Sanders: Well, Tavis, I am not a great fan of, you know, bringing forth a constitutional amendment every other day. But I do believe that, on this issue of Citizens United and campaign finance reform, it is such an enormously important issue. It so much speaks to the heart and soul of American democracy that that is the route to go. Tavis: While I’ve got you here, let me throw a few other issues at you that are in the news, just get your top line take on some of these issues. Chuck Hagel? Is he going to make it through with Defense? 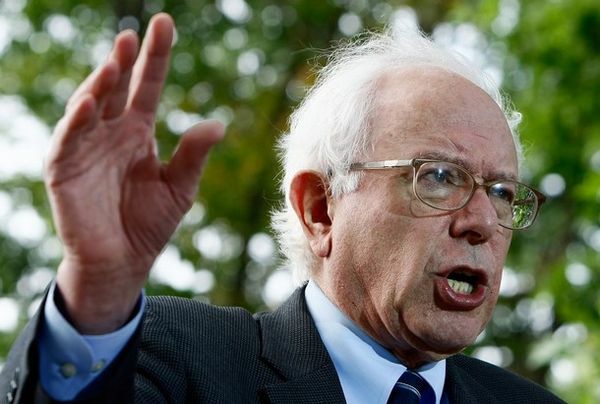 Sanders: I’m not much into speculation. My guess is that he probably will. Tavis: Will you vote for him? Tavis: What are you unsure about? Sanders: Well, there a couple of factors. I met with him and I’ve known Chuck for many, many years. I am concerned historically about his feeling about women in general, about gays in the military, as well. He reassured me that his views have evolved and changed and that’s good, but I still have some concerns about that. Tavis: Immigration. The president has given his speech on it. This bipartisan committee or bipartisan group, this gang of eight in your body, the Senate, has come forth with its proposal. The ultimate question is whether or not this year you expect that we will see meaningful immigration reform? Sanders: I would say that we have a reasonable shot in fact to do that. I think – and this is where elections do have consequences. The Hispanic community was very involved in Obama’s reelection. Democrats know that and Republicans are very nervous about their political future with regard to the Hispanic community. So I think there is, in terms of public support and understanding, that is just simply wrong, unfair that 11 million people continue to live in a sense in the darkness, not having their legal rights. There has to be a path toward citizenship. My guess is that will probably happen. Tavis: This is real, real, real, inside baseball political question, but PBS has a smart audience. I think most folk will come with me on this. For those who don’t, you can Google it and read about it because it’s too long to explain in 20 seconds. But it is meaningful, and that is this notion of whether or not there will ever be filibuster reform in your body? Sanders: It is a huge issue and I hope everybody in American understands what that issue is about. Since Obama has been president, the Republicans have done everything they can to obstruct anything, any type of legislation that benefits working people, addressing global warming and many other issues. A number of senators, Jeff Merkley, Tom Udall, me, others, work very hard to bring about real filibuster reform, and what does that mean? What it means is that the Senate is not the House and, if a senator strongly disagrees, he or she should be able to get onto the floor and talk for as long as he or she wants about the issue. But after that debate is over, after people have nothing more to say, we need 51 votes, not 60 votes, to pass major legislation. That’s why I voted against the so-called filibuster reform which really wasn’t filibuster reform. And here’s the point that everyone should know. We are not going to pass any significant legislation dealing with the economy, dealing with global warming, dealing with immigration, dealing with anything, unless we have 51 votes. By the time you get the 60 votes, it’s going to be watered down. Tavis: I got 30 seconds to go, but I don’t want to close without asking you what your primary goal is now that you are the Chair of the Veterans Affairs Committee. Sanders: We got many, many problems within the veterans’ community and many, many assets as well. I want to, first of all, make sure that every veteran in this country understands the benefits to which he or she is entitled. I want to deal with the huge backlog that we have in terms of the amount of time it takes veterans to get benefits. I want to deal with the suicide issue. Veterans are killing themselves at rates that are just off the charts. We got to address that. We have to address PTSD for those men and women who are coming home from Iraq and Afghanistan. There’s a lot to do for our veterans. Tavis: He is the longest serving Independent in all of Congress. He is Vermont’s Bernie Sanders. Senator, good to have you on this program. Always delighted to talk to you and get your take on the issues of the day. Sanders: Thank you very much, Tavis. Tavis: That’s our show for tonight. Thanks for watching. Until tomorrow night, keep the faith.